Plastic packaging is considered one of the main sources of waste. 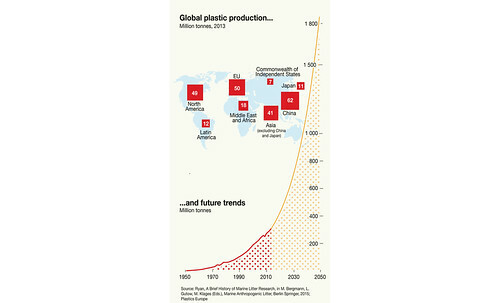 In Europe, plastic production comes in three broad categories: about 40 per cent for single-use disposable applications, such as food packaging, agricultural films and disposable consumer items; 20 per cent for long-lasting infrastructure such as pipes, cable coatings and structural materials; and 40 per cent for durable consumer applications with an intermediate lifespan, such as electronic goods, furniture, and vehicles (Plastics Europe, 2015). In the US and Canada, 34 per cent of plastic production was for single-use items in 2014 (American Chemistry Council, 2015). In China in 2010, the equivalent figure was 33 per cent (Velis, 2014). However, when we look at the plastic found in waste streams, packaging accounted for 62 per cent of the plastic in Europe in 2012 (Consultic, 2013). This confirms that plastic intended for a single-use product is the main source of plastic waste, followed by waste derived from intermediate lifespan goods such as electronics, electrical equipment and vehicles (Hopewell et al., 2009). For any form of publication, please include the link to this page and give the creator credit (in this case Maphoto/Riccardo Pravettoni) If the high-resolution file is not available, please contact grid@grida.no for request and permission for usage. Are most of the plastics produced still around? Which plastics float and which sink in seawater? We all contribute to this problem. Yes, all. And we need to act now if we want to avoid living in a sea of plastic by mid-century. This pilot project develops a shoreline map to define coastal areas with different likelihood of accumulating beach litter.